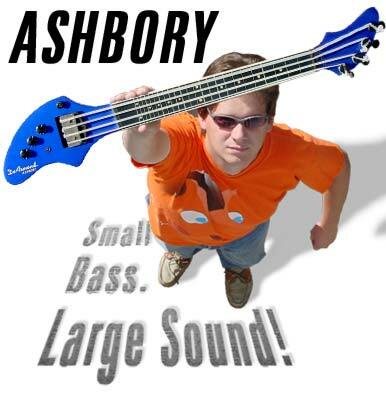 The Ashbory Bass is an 18 inch ultra short scale fretless bass with silicon rubber strings. The original "dog bone" style basses have been produced as the DeArmond Ashbory Bass, Ashbory by Fender, and the Guild Ashbory Bass. A 'Mark II' model also exists. New Ashbory strings and basses are available under Fender and DeArmond brand by Fender Musical Instrument Corporation. The Ashbory Bass sound is more similar to an upright bass than a bass guitar. This site offers resources for both current owners of Fender, DeArmond and Guild models, and those curious about this unique and wonderfully expressive instrument. Highlights of this site include an online Ashbory Bass tour, an FAQ, and a discussion area. » New to the Ashbory? Take the tour!